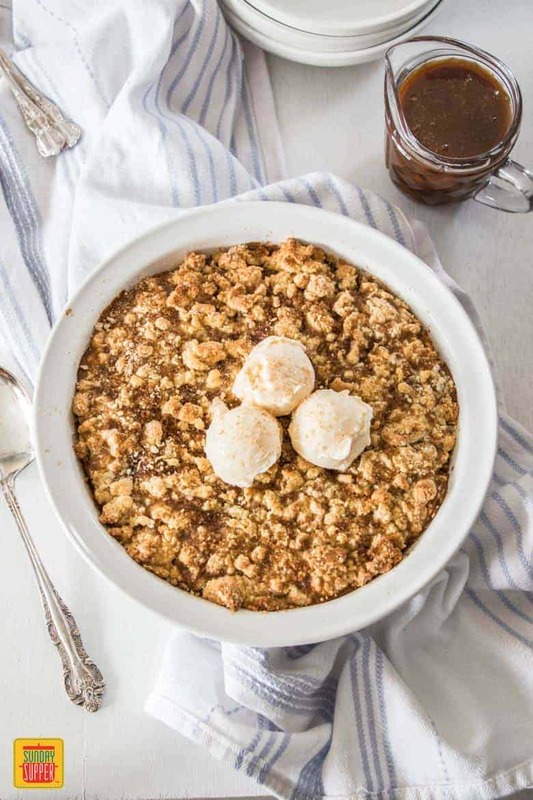 Pumpkin Cobbler, with it’s sweet, creamy pumpkin custard base, topped with a crunchy, crumbly cobbler topping makes the perfect comforting fall dessert. Wow! Is it that time of year already. Pumpkins are starting to show up in full force and I must admit, it gets me so excited. Fall is my second favorite time of year (Winter is my fave – yes I’m one of those weirdos). 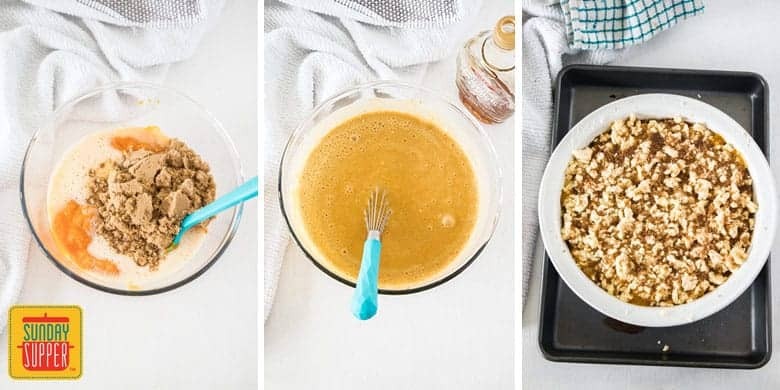 The weather is cooling down, the colors in nature are warm and comforting and all I want to do is curl up on the sofa with a cup of something warm and a bowl full of this delicious Pumpkin Cobbler. Cobbler is a sweet or savory dish with a filling that is covered with a crumb or batter type topping. Cobbler recipes are typically very easy to make. There are actually a few different ways to make Pumpkin Cobbler but this is definitely my favorite. Our Pumpkin Cobbler recipe has a custard filling with a crumb topping. We start by par baking a pumpkin custard and then adding the cobbler topping after about 20 minutes. The reason I love this Pumpkin Cobbler so much is that we end up with 2 distinct layers and 2 distinct textures. 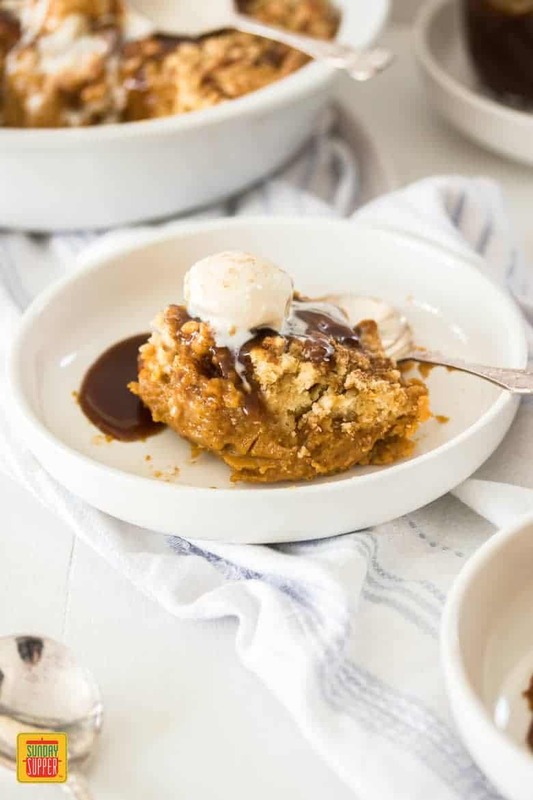 This Pumpkin Cobbler is incredibly simple to make! The custard ingredients get mixed together in one bowl before you pour them into your prepared pie dish. It’s a very liquid mixture but don’t worry, it cooks up into a silky-smooth custard. The cobbler topping is also just one bowl and a few minutes of your time. This part is totally optional (if you’re not me). Once the Pumpkin Cobbler is finished baking, I like to serve it up with this Spiced Butter Toffee Sauce. Talk about a match made in heaven. The sauce is a caramel made from scratch with vanilla and pumpkin spices added, making this a totally indulgent (but absolutely necessary, if you’re me) sauce to adorn your cobbler with. I’m a caramel fan from way back so I make this or salted caramel regularly. It takes around 20 minutes but is totally worth every moment. Check out my Chocolate Peanut Butter Caramel Cookies or these Caramel Chocolate Marshmallow Cookie Bars for more caramel goodness. In case you missed all of the above and skipped straight to the recipe (I don’t blame you) but sweet pumpkin custard, crunchy cobbler topping aaaaand a spiced toffee sauce. Umm, yes please – bring on that Pumpkin Cobbler and Fall please. 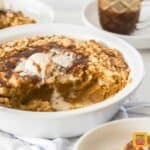 Serve this golden, creamy Pumpkin Cobbler dessert delight with some ice cream or whipped cream and you’re in fall sweet treat bliss. Pumpkin Spice Chocolate Chip Cookies, anyone? Pumpkin Cobbler with it’s sweet, creamy pumpkin custard base, topped with a crunchy, crumbly cobbler topping is makes the perfect comforting fall dessert. This one is teamed up with a decadent Spiced Butter Toffee Sauce. Preheat the oven to 180C / 350F /160C fan forced. Grease a pie dish with butter. Whisk together the eggs, sugar and maple syrup. Add the pumpkin purée, evaporated milk and vanilla and whisk well. Finally, sift in the flour, spice and salt and whisk until only just incorporated. Pour the mixture into the prepared pie dish and bake for 20 minutes. 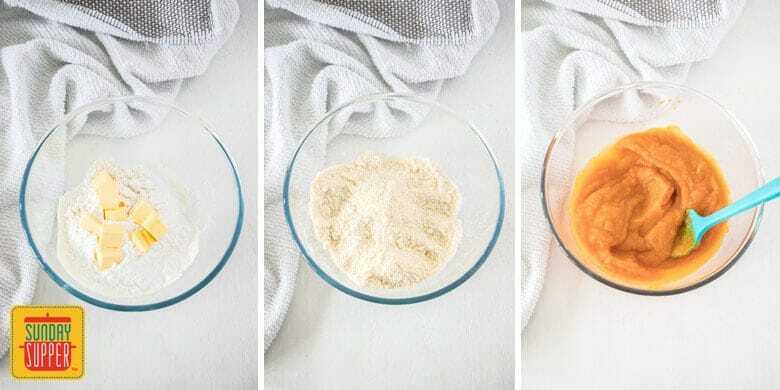 In a separate small bowl, mix the sugar topping ingredients and set aside. As soon as the custard has baked for 20 minutes, add the 1/4 cup of evaporated milk to the cobbler topping and mix through to make a dough. Starting from the outside edges of the pie dish, carefully sprinkle the cobbler topping over the custard in small clumps. Now sprinkle the sugar topping over the top. Place it back in the oven for 40 minutes, turning halfway through so that it bakes evenly. Place the sugar and water in a heavy based saucepan over medium heat and stir gently until the sugar dissolves. Bring it to the boil and stop stirring. Allow it to boil for around 7-8 minutes, without stirring. The temperature should reach 120C / 250F on a candy thermometer and it should be amber gold in colour. Add the butter. Whisk it in quickly until fully combined but make sure not to splash it. Now add the cream (be careful as it may splatter and bubble up) and do the same until all mixed through. Add the spices and vanilla. Allow it to boil for 3-5 minutes until thickened and glossy. It should be a deep golden brown colour. Allow to cool a little before use.